Because of the material used on the upper, the shoe doesn’t need any break-in time, is quite breathable, and feels natural. Buyers of Adidas shoes have the same comment about Damian Lillard’s fifth basketball shoe. Several users agree that although soft, the open mesh upper is still rigid enough to give support to the foot. Almost all testers prefer FitFrame over the SprintFrame chassis used in many Adidas’s lightweight shoes because FitFrame doesn’t cause painful pinching and irritation. One user comments that the adiPrene+ cushioning in the J Wall 1 “feels the same as Boost” when he does jump shots. Like the 3rd James Harden basketball shoe, the J Wall 1’s insole is quite thin to the point that he can feel the frame underneath. Players who are static on-court might feel some discomfort, a user warns. Although reliable, the traction is not anything spectacular. According to an expert reviewer, he even needs to wipe frequently on dusty and outdoor courts. One wearer says that the midfoot area feels narrow for him. Overall, the materials that it is made of and the support that it provides are the highlights of the Adidas J Wall 1. For a retail price of $115, you get average traction, a bouncy cushioning setup, lightweight support, and a secure yet comfortable lockdown. The traction issue is something I can look past when I play on clean courts, but dusty courts were a huge letdown. Sure Boost changes everything, but for a comfortable and affordable alternative, this shoe pays the bills. Overall, the Adidas J Wall 1 is a good everyday hoop shoe that gets the job done. It’s light, has good support and fit, and has a decent price for signature line. After switching from the Three Stripe’s subsidiary Reebok to the mother company Adidas itself, John Wall finally gets his well-deserved signature shoe. A mid-top with a breathable open mesh, FitFrame support, adiPrene+, and a storytelling outsole, the shoe is sure to capture his fans worldwide. Cushion. A full-length adiPrene+ foam is used in the Adidas J Wall 1’s midsole. This cushioning technology focuses on energy return and responsiveness, which results in the foam’s bouncy feel. The bounce, however, remains only in the heel area while the forefoot feels firmer to provide the user with a better feel for the court. Traction. The shoe implements a storytelling traction pattern that features the full map of the United States of America in the forefoot area when both shoes are placed side by side. The West Coast is molded into the left shoe while the East Coast is on the right. Several icons are scattered across the map, symbolizing the five national monuments such as the Golden State Bridge, the Space Needle, the Washington Monument, the Statue of Liberty, and the Gateway Arch. The map is filled with concave grooves that emanate from the Washington DC epicenter on the right shoe. This represents John Wall’s team of origin. On top of the map, “WALL” is spelled out with the “W” in three vertical lines – a nod to the Three Stripe company. The bottom then utilizes a unique shape that runs from the toe to heel, surrounding the map. Performance is guaranteed on clean courts. Regular wipes will, however, be needed on dusty courts. Length and Width. Reports vary on the length and width of the shoe. However, expert reviewers say that the J Wall 1 fits true to size. One tester shares that the midfoot felt a bit narrow for him in the midfoot. To be safe, try on the shoe personally in your local shoe store for an appropriate and comfortable fit. Lockdown. In place of Adidas’ regular SprintFrame technology, a modified version of the lightweight sneaker chassis called FitFrame is used on John Wall’s first signature shoe. Adidas made it levels more comfortable than the previous SprintFrame while retaining the support, stability, and containment it is widely known for. The shoe’s upper and traditional lacing system envelop and locks the foot down, especially the shoelace tab in the midfoot which is attached to the base of the shoe. 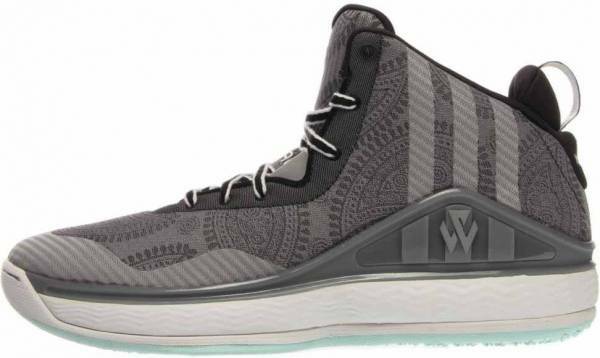 For the Adidas J Wall 1, the materials on the upper vary with each colorway. The original debut of the shoe featured a seamless, breathable, open mesh that felt comfortable to wear and doesn’t cause any bunching or pinching. The material doesn’t need to be broken in and is ready to wear straight out of the box. Some colorways use canvas, fuse, synthetic leather, and other materials. Fuse overlays are also added to protect the shoe’s high-wear areas. In the midsole, FitFrame and adiPrene+ work hand in hand to provide the shoe with containment and impact protection. The outsole, on the other hand, is made of a solid rubber compound. Although a mid-top, the Three Stripes branding in the heel area of the shoe elongates the collar making it look like a high-top. With its clean look, the J Wall 1 can be worn with not too slim pants. Make sure to tuck the cuff in the tongue area of the shoe to emphasize the John Wall logo. The Adidas J Wall 1 is available in a variety of colors. Discussed in the subsections below are some of the most popular ones. Outfitted in Red, Navy, and White, the “Away” colorway featured a gum outsole and a red speckled midsole. John Wall wore this colorway when he dedicated Washington Wizard’s victory against Boston Celtics in an emotional 133-132 double-overtime game to his 6-year-old friend Miyah who passed away due to cancer. Released on Christmas 2014 in a game where John Wall’s Washington Wizards faced the New York Knicks, the “Bad Dreams” colorway came in different shades of cheerful green, patched together with a black zigzag stitch that is reminiscent of Frankenstein. The upper used a canvas instead of the original mesh fabric.